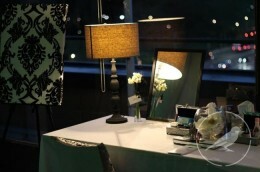 A dressing room provided for the ladies attending your event, is a thoughtful detail to lift the look and feel of your event. It is a space to allow ladies going straight from the office to your event, a chance to freshen up and feel ready to mingle. Pamper kit with a range of personal and beauty products to suit the theme of the event. A luxury set of hand gels and moisturisers for the ladies and gents bathrooms. Our high quality white rolled hand towels are a luxurious touch to any venue. Guests take a roll from a neat stack and dispose in a basket we provide.